What is there not to love about vegetables that taste like dessert? The sweetness and unique nutty flavor of acorn squash means that it usually makes a weekly appearance at our dinner table in the chilly months. What better way of presenting this scrumptious piece of seasonal produce than stuffed with a super flavorful and super healthy filling of chicken and quinoa. This dish goes above and beyond in the flavor department. All of the ingredients work together to complement each other, ending in an unbeatable dish that satisfies both sweet and savory cravings. But don’t just take our word for it. Give it a try! In this cooking video brought to you by your favorite online culinary school, we’re showing you how to make a healthy stuffed acorn squash. There’s no need to feel guilt when going back for second helpings of this dish! 2. Place squash on baking sheet, cut side up. Brush with olive oil, drizzle a little maple syrup and sprinkle with salt and pepper. Roast in the oven for 20-25 minutes or until it’s fork tender. 4. 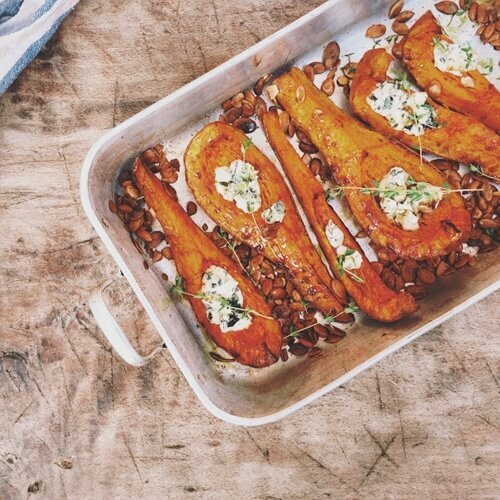 When squash is done, remove from oven and lower the temperature to 325F. Fill the hallowed squash halves with as much filling as it can hold. When all are filled, put back into oven and cook for an additional 20 minutes or until squash is very tender and everything is heated through. 5. Serve as is or topped with a cheese of your choice! We recommend a crumbled goat cheese.